Vulnerability, curiosity, doubting and asking questions are often mentioned as important traits for people in leadership positions, or for professionals in general. I find it interesting to see how we can stimulate these traits by getting better at asking questions. To explore ‘the art of asking questions’ I’ve conducted a little experiment, ‘crosstabulating’ the three most basic questions with each other, thereby generating nine different types of questions. We all know the basic questions “how?”, “what?” and “why?”, obviously. 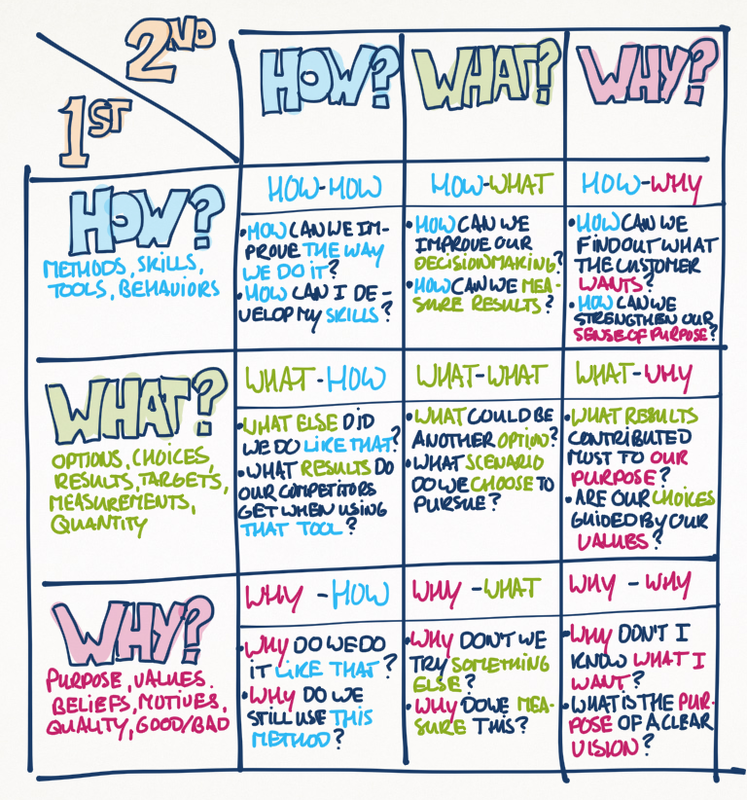 Some questions are easy to classify as ‘a why-question’ for example, while others are more difficult to categorise. In the drawing below, I explore nine different types of question consisting of a ‘primary doubt’, based on one of three basic questions, supplemented with a ‘secondary doubt’ to make the question a little bit more comples, and thereby -hopefully- more valuable and insightful. As you can see, the ‘complex’ questions can be described as ‘what-why’ or ‘how-how’ questions for example, and form quite distinct categories. I can imagine that individuals might have an ‘unconscious’ preference or bias towards certain specific categories, therby neglecting other types of questions. If this is indeed the case, broadening their ‘question repertoire’ might be helpful. Q: Do the categories work for you? And do you think ‘expanding your question repertoire’ is interesting to do? « Are you a winner or a succeeder?